Home Enlivening It’s So Difficult To Decide! It’s So Difficult To Decide! Life is about making difficult decisions sometimes. This is the part of our life that can cause us stress and make us nervous. We humans are not good at the act of selecting and deciding, especially when we are faced with two or more possibilities. When our options include more than one alternative, we tend to feel very stressed. Why is it when we are faced with having to take a course of action and make a decision about something, do we second guess ourselves, over and over again? If this is the case, if you have a very tough time and feel very burdened having to decide what to do about a person, place or thing in your life, then you do not have a healthy relationship with your intuitive nature. Our Intuition is the life force and spirit of who we are, it is our connection to our Soul. Our soul is our avatar, the warrior within us, the divine teacher and our instinctive compass, our inner Self that would never betray us. Our intuition provides us with inspiration, passion, enthusiasm, vitality and positive energy, this is the embodiment of who we are and what we can trust without having to doubt. Most of us know our intuition as our ‘gut feelings’, the little sensations we get when we know something is not right, or the very opposite, when something feels very good. We so very often tend to ignore this little feeling, we brush it off or change the subject, we make excuses, we work very hard at numbing our instinctive senses so we don’t have to feel or make a decision of any sort. Humans like consistency, we are a bit like a clock, ticking along day after day with our routines, our set behaviours, working always within the strict guidelines that we have put in place for ourselves, or worse, someone else has placed those boundaries for us. We can get so complacent, and that is why when our gut feeling wants to get our attention, we push those feelings aside as fast as we can. It’s scary to think that we might have to change things up, so many questions arise that might scare and frighten us. How will I take care of myself, can I live alone, will I lose my friends, what if I don’t find another job, financially how will I manage, should I move in, should I take that other job, our mind will travel to all kinds of dark and fearful places when we are faced with having to make a decision, whatever it may be. But the silly thing is, we already know the answer and all of the time we have taken pondering over the choice we have to make, the answer to our question has been there inside of us all along. 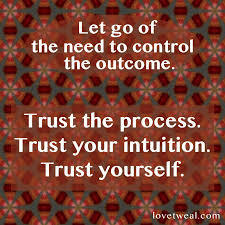 Our gut feeling has been reminding us over and over again giving us signs and signals to the situation at hand. Allow yourself to tap into the place inside of yourself where your courage is waiting for you, everything you need to decide what to do is waiting for you in that place. Making the decision is the most difficult part once you decide everything will fall into place if you listen to your intuition.